In 1086 Ashburton had 60 households, and the tax assessed was 6 geld units. There were 34 villagers, 16 smallholders and 10 slaves*. There was land for 20 ploughs, 3 acres of meadow and 1 league each of pasture and woodland. Livestock comprised of 1 cob (ie a horse), 5 cattle and 76 sheep. The lord and the tenant-in-chief was the Bishop of St Peter, Exeter, and the value had been ₤8, but was now ₤20. * Only the heads of households were counted. 1102. The Council of Westminster decreed 'Let no one hereafter presume to engage in that nefarious trade in which hitherto in England men were usually sold like brute animals'. 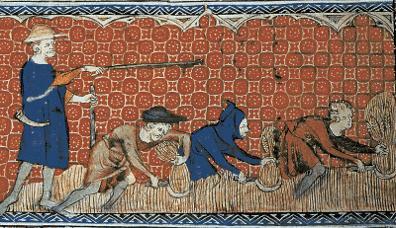 However, in the Middle Ages the life of a serf, the person at the bottom of social hierarchy, was little different from that of a slave. They were legally tied to the land: able to grow their own food, but also obliged to work for their lord. 'They were in effect owned by the landowner'. Above right: Reeve and serfs. September 1418 Geoffrey Attewey, a servant born on the Bishop's manor of Ashburton, received his manumission (freedom) on Sept 2nd, signed and sealed by the Dean and Chapter on the 3rd. William Geffrey, also born on the Bishop's manor of Ashburton, had received his manumission on June 6th. 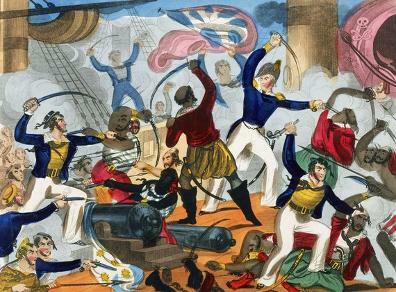 From the 1600s until the beginnning of the 19th century North Africans - the Barbary Corsairs' - captured English men and women for slaves. The British government twice used the navy to secure their release, and one list has survived of those who were rescued. A separate list details where the captives came from - one unnamed person was from Ashburton. Usually, however, when we think about slaves, we are thinking about Europeans trafficking Africans across the Atlantic: 'The African Trade'. This trade began in the 16th century but reached its peak in the 18th, involving merchants buying various commodities - and people - in one country to sell to another. By the early 1700s The Royal African Company was buying cloth from Devon as one of the items that could then be sold abroad, with the money used to buy goods such as gold, ivory, and hides. These were then sold back to England. Although these goods produced two thirds of its income, the single greatest commodity that the company bought in Africa was slaves, who were sold to the West Indies. The petition states that when trade in fine serges decreased, the clothmakers turned instead to making a coarser serge called perpetuana, which they sold to the Coast of Africa. 'A Company' was trying to restrict this trade to itself, which would leave the 'Petitioners exposed to the utmost straits'. The matter was referred to the House of Commons, which regulated the African trade. Documents Illustrative of the History of the Slave Trace to America, Elizabeth Donnan, New York 1965, vol 2, p140-141. In April 1741 John, the son of Thomas Smerdon 'Minister of Woodland' was baptised. A John Smerdon married Elizabeth Madge, a daughter of Stephen and Dorothea Madge. Stephen Madge, Rector Clerk of Combeinteignhead, later left a will, proved in the Prerogative Court of Canterbury. One of the beneficiaries was his daughter Elizabeth, wife of John Smerdon, attorney at law. John and Elizabeth were currently living at Ashburton. The will also made provision for the repayment of a debt of £600 which John owed to his sisters-in-law Sarah and Ann. John and Elizabeth had a number of children, one of whom was Thomas Madge Smerdon, baptised at Ashburton on the 23rd January 1769. Using sources such as the Liverpool Muster Rolls, Stephen D Behrendt has determined that Thomas moved to Liverpool*, and was captain on slaving voyages between 1790 and 1798, the first at age 21. This made him the youngest captain in Stephen Behrendt's study. *Probably via Bristol - see below. Amongst the PCC wills for Ashburton people is one for Thomas Madge Smerdon, 'Captain of a vessel in the African trade'. It was made in September 1799, when, as the will says, Thomas was on a visit to Ashburton. William Southcott Young, surgeon, was to be his executor, and his estate was to provide an income for his mother (not named), and after her death was to be divided amongst his brothers and sister (also not named). In a codicil Thomas appoints another executor, his uncle Mungo Charles Wright - a mariner from Bristol. Sarah Madge married Mungo Wright in Bristol in 1783. Although Thomas's will says Mungo is a mariner, Mungo is a 'merchant of Bristol' in his will of 1817. The codicil gave Mrs Mary Harrison of Liverpool £10 (this appears to be for 'mourning') and he gave his gold watch to his godson Charles Young. Mungo Wright travelled extensively on the slave ships from 1771 onwards, when he was master of the Molly. In 1790 he was both the master and one of the owners of the Mermaid, which according to one report shipped 140 slaves, including 25 boys and girls under 4 feet 4 inches tall. Two women, one boy and one girl died crossing the Atlantic. By 1790 Thomas Smerdon was the master of the Royal Charlotte, which Mungo Wright partly owned. It took 140 slaves to the West Indies. He was master of the same ship in 1792 and again in 1793. It seems likely that the Thomas Smerdon above was Thomas Madge Smerdon, and that he got involved with the 'African trade' through the activities of his uncle Mungo Charles Wright. John Swete was baptised John Tripe on the 13th August 1752 at Ashburton, the son of Nicholas and Rebecca Tripe. His father, Nicholas, was a noted surgeon in the town - see the Doctors and surgeons section under Banks and businesses. In his 1795 autobiography, 'A Sketch of My Life' he wrote that he was born in July, and that his mother before her marriage was Rebecca Yard. His former home had by then become the Golden Lion Hotel. Devon Record Office Z19/3/1, reference given in Travels in Georgian Devon - see below. Mr Smerdon, and then his son the Rev Thomas Smerdon taught him at the Ashburton Free School - the Rev Thomas Smerdon would have been the grandfather of Thomas Madge Smerdon (above). Sir Robert Palk helped him to get to Eton in 1769, and from there he went to Oxford. He took Holy Orders in 1781. Travels in Georgian Devon, the Illustrated Journals of the Reverend John Swete (1789-1800), Todd Gray and Margery Rowe, Editors, Devon Books 1997, vol 1 pp vii foll. It was because of this inheritance that he changed his name from Tripe to Swete. 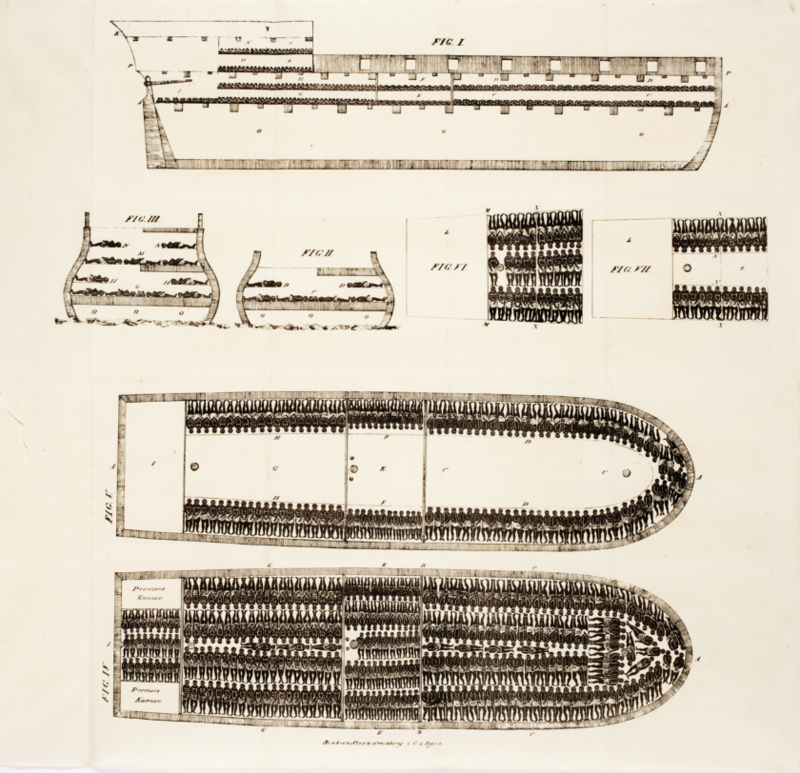 1787 saw the formation of the Society for Effecting the Abolition of the Slave Trade, but it was not until 1807 that the Abolition of the Slave Trade Act entered the statute books. 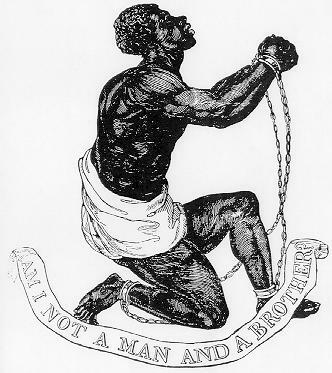 This made it illegal to trade in slaves within the British colonies, but there was no obligation to free existing slaves. Right: Official medallion of the British Anti-Slavery Society. *I can find no record of a Trefuis (or even Trefusis) Love. However, a Reverend Trefusis Lovell was born in Plymouth, and became chaplain to the Earl of Bristol. He was later Archdeacon of Derry and finally became Rector of St Luke's, Middlesex, until his death in 1844, aged 77. From the records below it seems fairly certain that the Reverend Lovell was the cleric preaching at Ashburton. William Taprell and Elizabeth Joynt married in Ashburton on June 27th, 1792. The officiating minister was Trefusis Lovele. This was one a series of marriages from the 14th February 1791 that Trefusis Lovele, or Lovell, performed, previously signing himself as curate. Marriages immediately after William and Elizabeth's were performed by Wm Cockey, curate. *Part of the peace process? It was not until 1833 that a further act (gradually) abolished slavery altogether throughout the British colonies. British taxpayers paid £20,000,000 in compensation to plantation owners in the West Indies. There is a database of owners at the time of abolition, which can be searched. To date, no-one from Ashburton has been identified. 1841 The children of the Baptist Sunday School in Ashburton had a special tea to celebrate the anniversary of the emancipation of the West Indian slaves. Charles Tippett was the minister.